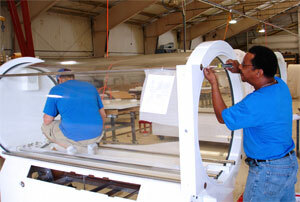 Perry Baromedical is a registered medical device manufacturer. Perry Baromedical is an ISO 13485:2003 certified world leader in the manufacture, installation and service of hyperbaric oxygen therapy systems for medical application. Hyperbaric Oxygen Chambers are United States Food and Drug Administration (FDA) Class II devices and are controlled by federal law. All systems are designed, manufactured, tested and installed in accordance with the current regulations of the FDA, The American Society of Mechanical Engineers (ASME/PVHO-2) Codes, The Pressure Equipment Directive (CE Mark), Medical Device Directive (CE Mark) and the requirements of the National Fire Protection Agency (NFPA). Perry Baromedical is a distinguished and internationally recognized brand name, with a history of more than 50 years of design innovation and quality manufacturing in its field. 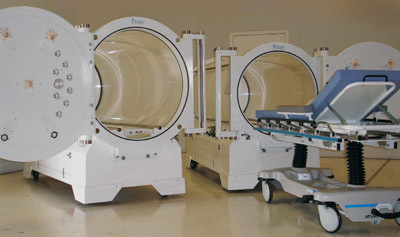 Perry is the only full line manufacturer of hyperbaric chambers in the industry, with its product line encompassing monoplace, dualplace, and multiplace systems. The Company sells its products to hospitals, private clinics, medical teaching institutions, critical access and children’s hospitals, and burn institutes across the globe. Perry leads the HBO industry with a reputation for doing business with integrity and providing products of superior quality.